Born in 1957 in Nancy, Pascal Génin started to learn Shotokai Karate in 1972 with Gérard Letensorer and Master Murakami, from whom he followed trainings at once, notably in Sérignan in July 1973. He teaches within the MJC Lorraine since 1976. He was appointed black belt 1st dan in January 1977.He was appointed 4th dan FFKAMA in January 2002. He is also federal instructor and judge for 1st and 2nd dan ranks inside the League of Lorraine. 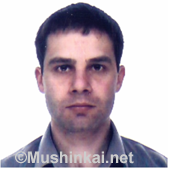 Born in 1973, Alexandre Normand starts to learn Shotokai Karate in 1987 within the MJC Lorraine club in Vandoeuvre, supervised by Pascal Génin. Black belt 1st dan in 1993, federal instructor the following year, he joined in 1998 the dojo of Paris supervised by Luís de Carvalho. Now black belt 2nd dan, Alexandre Normand teaches karate in Ennery (between Metz and Thionville) since 2003. Born December 24th, 1952 in Toulouse, Jésus Aguila started to learn karate in 1992, in the Club of Blagnac, supervised by Xavier Corbin. He became black belt 1st dan in 1998 and federal instructor in 2003 to assist Xavier Corbin in the management of the club. He assumes the Presidency of the Club since 2003 and worked on its transfer within Toulouse Université Club, in the Faculty of Science Paul-Sabatier in Toulouse.